One of my apartments had a pretty bad bed bug outbreak so I purchased this kit to treat the problem. Only the downstairs unit had bed bugs but I treated both up / downstairs since they will travel. I had used one of the cockroach control kits from here previously with great success so I had confidence in the quality of the products from DoMyOwnPestControl. I like the kits as they offer several active ingredients to help combat chemical resistance in the bugs. I ended up treating several times over the course of three months. Bed bugs are tougher to eliminate than roaches. I put Alpine Dust in electrical receptacles / switches with face plates off. I used Temprid on baseboards / bead frames / cracks and crevices. And finally I put Phantom on the tuffs / seams of mattresses / sofas. Additionally I gave tenants spray bottles with Steri-Fab to spray on any bugs they noticed. During treatments the pets went to a pet sitter so they were not around until all the product dried. It looks like the bugs are gone now but I am going to treat periodically for a couple of months to make sure there are no eggs that hatch out and bring the bugs back. I also directed the tenants to strip all the bedding and launder it with high heat dryer cycle to kill anything in there at time of 1st treatment. Told them to do same for as much of their clothing as they could do. This is the best stuff I've used! It kills bed bugs on the spot and surely will keep them from coming back! The bed bugs seem to be under control. We are still cleaning and applying . It was much less to do it ourselves than to hire someone. This was my first encounter with the bed bugs. Since there are 6 appartments in the building, we needed something good. I am well satified thus far. Would recomend this product. Sprayed as recommended, I used this for my house,4500 sq ft. Plenty left over. I am so glad I bought this product, it works great. I suggest that you buy mattress and box spring covers as well. By doing it myself I saved a lot of money. Exterminators wanted to charge $650 for one apartment. A quote from local exterminator was $1000. purchase the commercial kit after reading reviews. Te kit arrived about 2 weeks ago. We sprayed out 2200 sq ft home two weeks ago and again today. No bed bugs were seen after the first use. 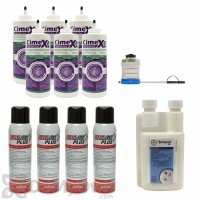 Furthermore, we still have alot of the product left for maintenance. Will buy again. We have referred this company to others we know who are having a difficult time eradicating these bugs. These products are very effective products to treat serious bed bugs and coach roach. This stuff is simply amazing. After just one application bites are gone..Gonna treat my house agn this weekend.I would recommend this product to anybody. We struggled for months to get rid of our bed bug problem. Spent a fortune and they just kept coming back. Finally we bought this kit along with a gallon size sprayer. After the first application we have seen a total of 3 bedbugs in 2 weeks. No bites!! We have a 4 bedroom home and we already used 2 of the 4 aerosol bottles on our 1st application, so hopefully we won't need to order more to make it to the third application. The instructions were very clear and easy to follow. I know that after 3 applications these products are going to solve our problem. We've already made so much progress! One thing in the instruction sheet they send they say to double the strength of the stuff you put in the sprayer but the instructions on that product say not to double the strength for bed bugs. So we didn't double it, and it still worked very well. I'm so glad i didn't throw away all my furniture and beds! I did buy a steamer from another website, a household canister type for about 80$ and I think that helped alot especially with the upholstered items. Make sure to get under your dressers and in all the cracks and crevices, I couldn't believe my son's dresser had a million of them underneath it! Not in the drawers, UNDER it--we turned it upside down and there they were! Seems like they hide more in the cracks of the floorboards/baseboards then they do in the mattresses! Also, don't forget the closets, and don't forget to wash all your linens--I even washed my clean linens in my linen drawers and found live bed bugs crawling through the clean folded sheets!!!! So be thorough, repeat applications, and I believe this product will help you rid your big house of your bed bug problem once and for all! Take it from someone who dealt with this problem for a few months and did A LOT of online research and finally found my solution--THIS STUFF WORKS! Fantastic Bed Bug Killer! Kills everything bug. wow, remarkable kit. Only used once and haven't seen a bug since. I have more than enough leftover to do my entire neighbors houses! Thank you so much, you saved me $100s of dollars. I bought the commercial kit ($219). I only had to treat my home once (2400 sq ft) with the sprayer. I also used the cans to spray in hard to reach crevices. This did the job. I had plenty left over so I loaned some to 2 other people with great results. The powder keeps them from coming back. Highly recommend this product. Buy the sprayer too. I used this kit to treat for bedbugs in my 2400 sq. ft. home. It only took 2 applications and the bedbugs were GONE! I did wash my curtains and put plastic over the mattress and boxspring. I had a lot left over and lent to 2 family members who also reported the same results. A fantastic product. This was absolutely great! I followed the instructions to the letter and within 21 days I saw no more bed bugs! The Phantom is the best for the quick kill and mixing the Temprid was very simple. I would certainly recommend this site to anyone that wants great products at great prices. hi iam in my six month bug free that temprid is the best and did try a lot of them somebody got it right. This is the only one that worked! I got a bed bug infestation in a three family property recently. I tried many things, I was not able to control the situation. Finally, I tried this, and thank God it worked, three weeks now, there is no bug found. I am very happy with domyownpestcontrol. they have the best prices and very fast shipping. This is a great complete product. I have a friend who is an exterminator and he states that this is the same product that he uses. Giving good results. Let us wait for 15 days and see the results. Thanks. Great product that has many weapons. Got the job done! I am in the process of using this product and no conclusive results yet. It is nice to have a variety of treatment products/methods to tackle the issue at hand. used the commercial bed bug kit to wipe out a small bed bug population. i like the idea of coming at the problem from different directions. the two different chemestries with the silica powder deals a knock out blow. also with the kit we used mattress and box frame covers, bed bug sticky traps and a steam machine. several weeks and no bugs in the traps.